Prompted by public outcry over a property owner's move to bulldoze an alfalfa field and turn it into an RV park, Eddy County commissioners spent half of 2017 drafting an ordinance to govern so-called "man camps" in the southeastern New Mexico community. The camps collect RVs that house the increasing number of oil and gas workers in the region. Until that new ordinance took effect this month, no county code defined worker camps or regulated where they could appear, how much acreage they needed or how many people could live in them. At a series of public meetings, county residents groused about traffic, trash, dust and noise coming into their otherwise quiet neighborhoods. So Wesley Hooper, who handles code enforcement as Eddy County's director of community services, went out to see and assess the issue. In just four square miles of the county, he counted 35 such worker camps. It's a low bar—just two RVs constitute a camp, but some collected five or 10. He didn't want to estimate their total number in the county. At some, he found bare electrical wires on the ground, and not all had the necessary sewage treatment systems. Renting space to park an RV with the proper hookups can run more than $650 per month. "It's crazy how many of these trailers are coming in," Hooper says. "This area and south of here is just booming like you can't believe." 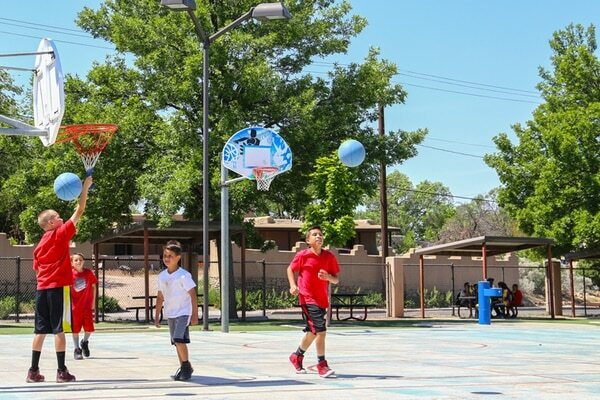 The camps are just one metric to measure a boom that may brighten the state's revenue outlook while creating some costs and burdens to those communities. Oil and gas industry advocates look to make the most of this latest rush, while fossil industry opponents caution of the impacts on public health, the environment and long-term ramifications to public lands. Between July 2016 and July 2017, the number of oil rigs working in the Permian Basin jumped from 172 to 379, according to the Baker Hughes Rig Count. The way Carlsbad Mayor Dale Janway describes it, it sounds like they've stepped up from the farm team. 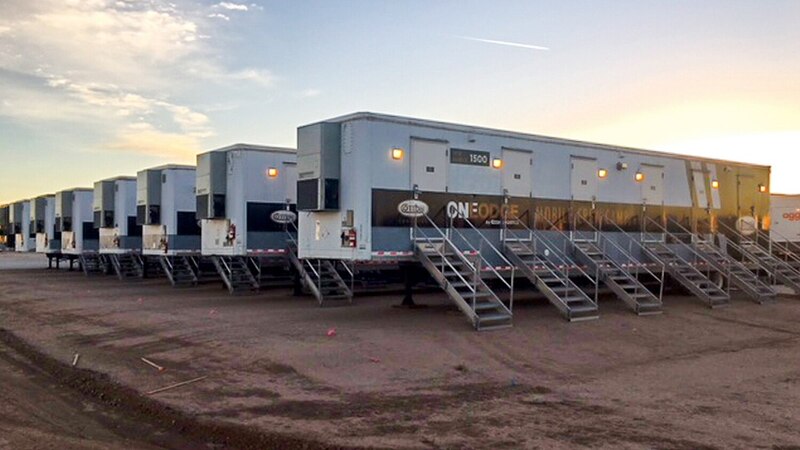 "The majors" have arrived: XTO Energy, Chevron, Occidental Petroleum, Anadarko, Devon Energy, Apache, Santo Petroleum, EOG Resources. Carlsbad, which sits atop the basin, is stretching to meet the demands of becoming, by some projections, the new Bakken Formation—taking the title from oil fields that have been lit up with so many flares that, from space, it looks like that part of North Dakota now houses a city. "What we're told is that these reserves are the most developable in the world, other than Saudi Arabia," says Steve McCutcheon, Carlsbad city administrator. The city's water infrastructure is ready for higher capacity, but other areas are struggling to keep up. Apartments lease faster than they can be built, so a few FEMA-style temporary housing units have gone up, some with as many as 400 beds. At least one includes a basketball court, small grocery store and a cafeteria, open 24 hours a day. Downtown roads are congested, and state highways and county roads are seeing heavier traffic than they were built to handle. That's a basic headache—Hooper says that during his drive home, the highway backs up for a mile and a half, and a commute that once took 10 or 12 minutes now takes about 25. But it's also a safety concern. Highway 285 from Carlsbad to the oil field is two lanes and lacks a shoulder. That highway often packs bumper-to-bumper with white trucks for oilfield workers, water trucks, dirt trucks, oil-hauling trucks and service trucks, Hooper says. 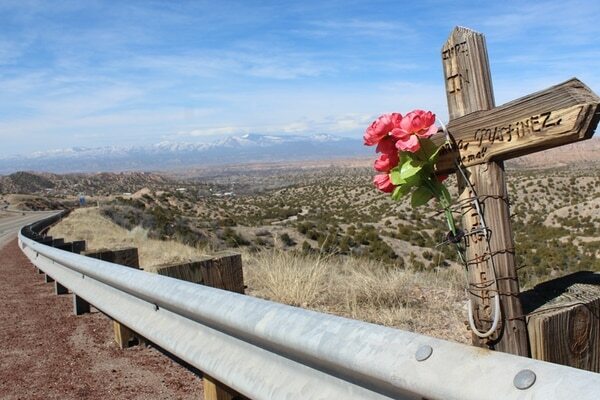 In the last couple months, it has seen a number of fatal crashes. State proposals to add turning lanes are years out, he adds, and the county needs them now. "Usually communities grow at a slow pace, but when you have something like this and it booms, and you have a huge influx of people, it makes it tough to adjust," he says. How many people has the industry brought to town? "We'd just be wild-guessing," Janway says, "but it's substantial." The New Mexico Oil and Gas Association wants to make the most of this resurgence in the Permian Basin and a friendly political landscape, according to the association president's address during its 2017 annual meeting. The association aims to build a better ground game, said Ryan Flynn, who left his post as cabinet secretary of the state's Environment Department to become the association's executive director, and to drive policy, public discourse and elections. 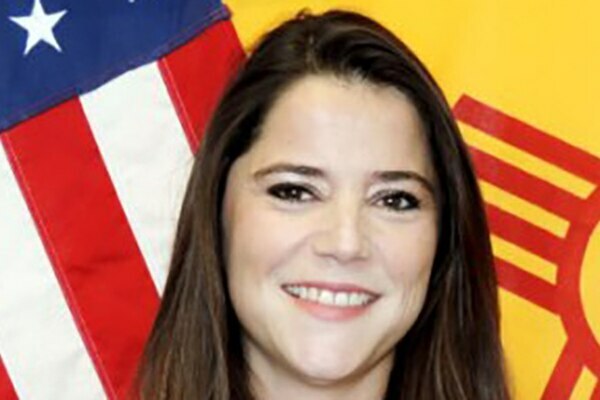 "NMOGA is going to be the most powerful organization in the state of New Mexico, period," he said, according to a recording of his remarks from the closed-door meeting that was leaked to SFR. "We are looking to influence the narrative and win these disputes as we move forward." 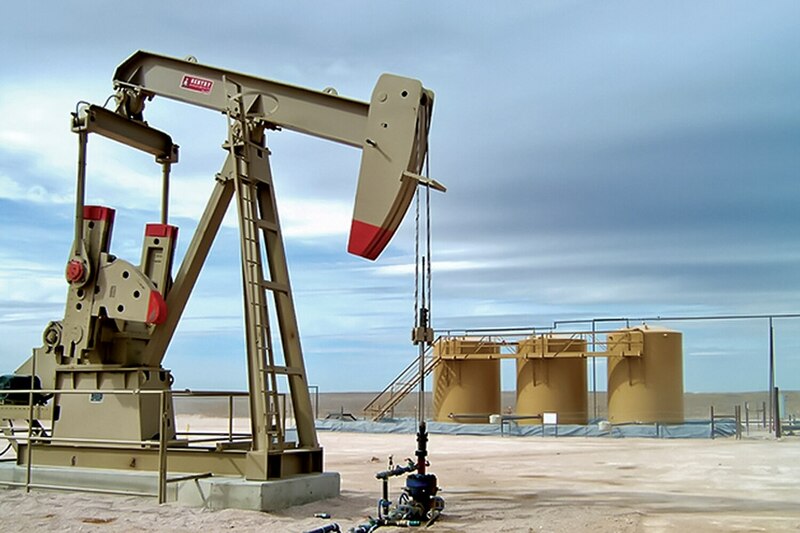 A third of New Mexico state government's revenue comes from the oil and gas industry, which will likely be on the minds of legislators as they head into this month's budgeting session. This year's tax revenue from oil and gas is up, but it's a volatile market, dictated by variables such as the whims of the Organization of the Petroleum Exporting Countries (OPEC), the weather and overall economic growth. In late 2014, a glut of supply dropped the price for a barrel of oil, and the state's revenues from the industry plummeted. Last year, with prices having climbed above $40, those tax dollars also increased. When the United States Geological Survey energy resource program's projections on the Permian Basin's reserves in southeastern New Mexico and West Texas were released in 2016, Walter Guidroz, program coordinator, said, "Even in areas that have produced billions of barrels of oil, there is still potential to find billions more." Based on the USGS' estimates, the basin holds three times as much as the Bakken Formation in North Dakota. For context, an energy reporter for the Houston Chronicle noted, "That's enough gasoline to drive your car nearly two light years." The Permian Basin has been active since the 1920s and has produced more than 39 billion barrels of oil. Many thought its best days were behind it, at a 1973 peak of 763.5 million barrels that year. Then, improved technology for horizontally drilling wells, hydraulic fracturing, and using water flooding and carbon dioxide injection to extract oil changed the outlook in the mid-2000s. In 2016, the Permian produced 740 million barrels in both states. The latest projections for the basin from IHS Markit promise game-changing reserves. A new 3-D model based on a century's worth of data suggests it could contain 60 to 70 billion barrels of technically available fossil fuels. 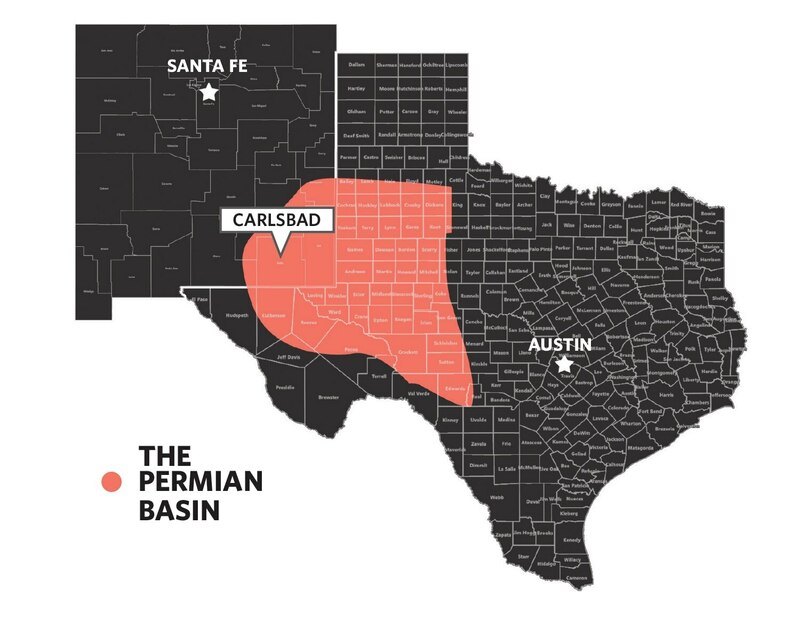 The firm, which analyzes data for capital-intensive industries like energy and transportation, says the Permian now ranks as "America's super basin," with a potential for lower-risk, lower-cost wells. This isn't news to oil and gas producers, who spent much of 2015 and 2016 snapping up acreage in the Permian Basin for headline-catching prices. In West Texas, bids for mineral rights, which can go for as little as $2 per acre, soared to $60,000 per acre. 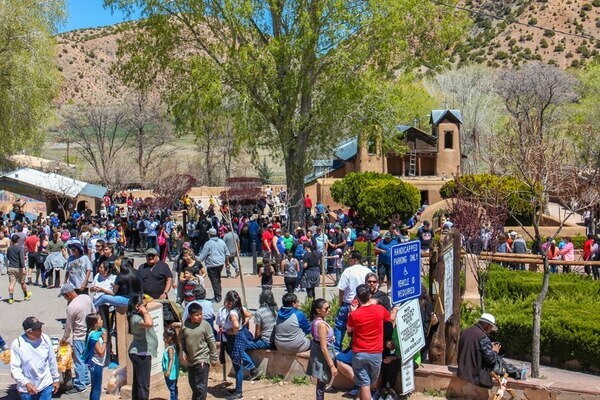 In southeastern New Mexico, bids went as high as $26,700. Though oil prices have hovered around $50 for the past year, some of these reserves have "breakeven prices" at $40 per barrel. In the first week of 2018, the price per barrel topped $60 for the first time since June 2015. 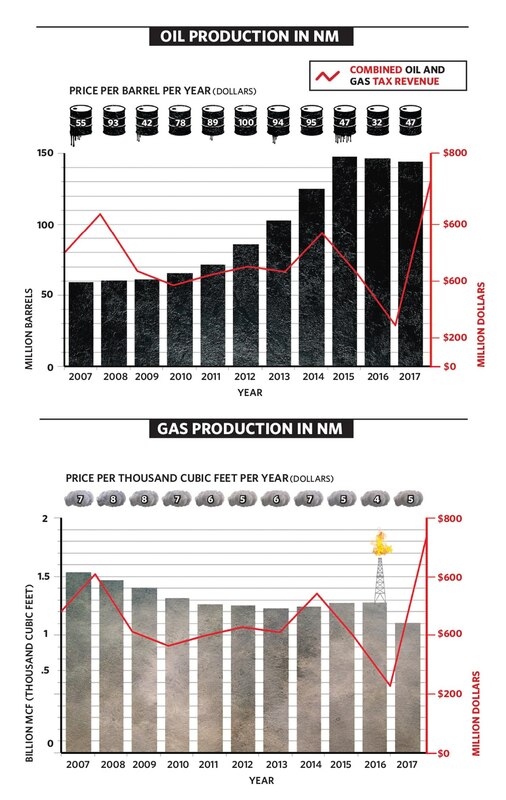 Early production numbers show that 2017 is on track to see more than double the amount of oil produced from New Mexico than a decade ago. The number of drilling rigs in the state has spiked. What's tanked in recent years is public opinion about oil and gas development, Flynn told his group last year. He opened his remarks by talking about how nice it was to be in Santa Fe and not face a room full of people "carrying signs or booing." "For one weekend a year, I've got more friends than opponents in Santa Fe," he said. 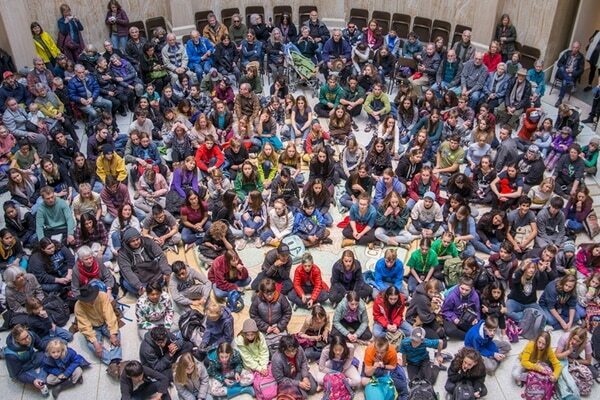 The WildEarth Guardians environmental advocacy organization gave a recording of his speech to SFR, acting as an intermediary for a meeting attendee who asked to remain anonymous. When contacted for further comment, NMOGA's communications director Robert McEntyre said the recording was "unauthorized" and objected to the newspaper quoting from the members-only meeting. But WildEarth climate and energy senior campaigner Rebecca Sobel says it's just part of watching out for the public. "The public has a right to know who and what is standing in our way of justly transitioning to more equitable energy economies," she writes in an emailed statement. "Our state and our industry is facing unprecedented challenges," Flynn told association members. "New Mexico truly is the tip of the spear when it comes to anti-industry rhetoric and mobilized opposition. Our industry operates in a constantly shifting environment, and two of the greatest challenges we consistently face are political uncertainty, or regulatory risk, as well as a well-established, extremely well-funded activist machine operating in the state of New Mexico." With only three more years guaranteed with the Trump administration's support of the industry, he said, the association needs to act now to influence federal policy. He'd like to see the feds offer the same assurance Gov. Susana Martinez has as "a backstop to prevent harmful legislation from being passed." The pending gubernatorial election calls that into question. Groups "with the anti-fossil fuel agenda" are spending money on elections and recruiting candidates for local races, he said, and they aren't looking for "a sensible balance." While Flynn insisted the industry is committed to environmentally responsible oil and gas development, he says it's facing an opposition that will settle for nothing less than an end to fossil fuels. The two biggest issues he's seen come under fire are hydraulic fracturing (fracking) and methane emissions. "Opposition to hydraulic fracturing," he said, "presents the greatest threat to our industry and to our license to operate moving forward. This is obviously not a science- or fact-based discussion. It's an emotional discussion. But unfortunately, our polling reveals that over 55 percent of New Mexicans are opposed to hydraulic fracturing." That sentiment now crosses party lines, he said, a shift from just a few years ago that he attributes to prolonged campaigns about concerns like fracking near Chaco Canyon. If taken to the polls today, he said, "we would see an overwhelming majority of New Mexicans take action to prohibit hydraulic fracturing." Now, methane is poised to be the new fracking, he said. Regulations were drafted during the Obama administration to limit methane emissions from oil and gas facilities, but the Trump administration stalled their implementation. The industry calls them unnecessary. Proponents of the regulations, including Senators Tom Udall and Martin Heinrich and gubernatorial candidate US Rep. Michelle Lujan Grisham, point to millions in lost tax and royalty revenue as well as the cloud of potent greenhouse gas sitting over northwestern New Mexico's natural gas fields. Lujan Grisham's campaign has announced a plan for mitigating methane emissions, arguing that such regulations would create jobs, add $27 million in tax and royalty revenue, reduce toxins and smog-causing pollutants, and slow climate change. "New Mexicans haven't really made up their mind about methane, and they don't quite understand the issue," Flynn told meeting attendees. "So we believe we absolutely can win this fight, but we need to be proactive and we need to make sure we are communicating once again all the great things our industry is doing to reduce emissions, to innovate, and to stay ahead of the curve." As part of that effort, the association will "build an army" of supporters, he said, to increase turnout at meetings and digital engagement. 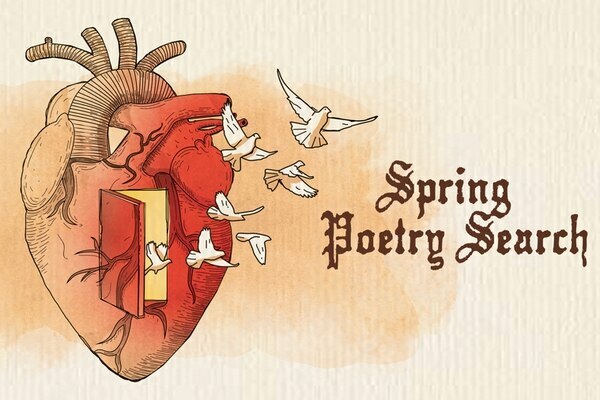 Their core mission will be to deliver the message that the industry boosts the state's budget, funding one in three teacher's salaries and supporting 100,000 jobs. "We've got a window right now, over the next year, to really put in place the pro-industry narrative at the federal level and at the state level," he said. McEntyre declined to answer a series of questions about Flynn's statements. 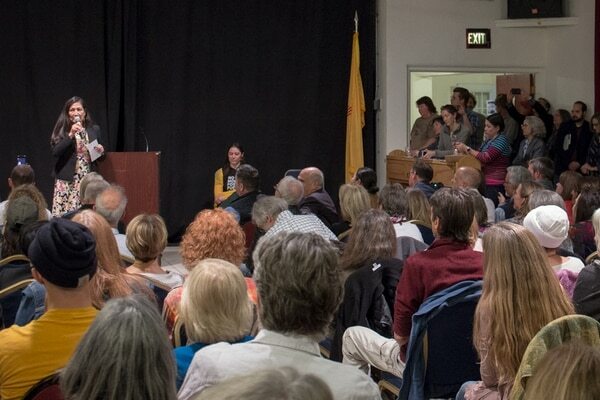 "The misinformation and falsehoods pushed by activist networks give the public a distorted and inaccurate view of reality, and NMOGA is committed to communicating directly with New Mexicans and giving them the fact and science-based perspective of our industry that they deserve," he writes in an email just before press time. In 2017, the US Bureau of Land Management auctioned more than 1 million acres of land for oil and gas development in Colorado, Montana, Nevada, Utah, Wyoming and New Mexico, Sobel of WildEarth Guardians points out, and the agency is on track to sell nearly a million just in the first half of 2018. "Across the West, this administration has been delivering on industry wish lists, rubber-stamping development and steamrolling the public process and environmental protection," Sobel writes. "While NMOGA spends its coffers greasing the skids to reduce regulations and further frack the Land of Enchantment, New Mexicans across the state are busy struggling with the impacts and related health costs of increased fracking, including increased cancer and related health impacts, record-breaking oil and gas 'incidents,' and continued assaults on Indigenous rights, clean air and water." If plans to grow face constraints, it may come down to workers. Oil and gas industry analyst BTU Analytics says they're hearing reports from the Permian Basin that jobs, particularly truck-driving jobs, have been tough to fill. "Really the biggest limiter on that growth will be the amount of people you can put to work out there," says Tony Scott, a partner at BTU Analytics. "At this point, it's not a quality of rock issue. It's a getting enough people, getting enough infrastructure across the entire value chain up and running." Trucking jobs require more of workers—hazmat training, a clean drug test—than some other industry jobs. When oil prices were $100 per barrel, service and trucking companies could lure drivers with salaries of $100,000 to $150,000. But lower oil prices correspond to pay cuts. Those jobs now pay $50,000. At that rate, the trouble and instability aren't worth traveling from out of state, as many do, to take these positions, Scott says. As prices climb, that might change. Overall, low unemployment rates nationally—and at 4.9 percent as of October in Eddy County—also reduce the number of potential employees. "They were having problems as early as 12 months ago finding qualified drivers, especially in the Permian Basin, as activity is ramping up, and all we've seen is more activity over the last year," Scott says. Bloomberg reported in December that the Permian Basin was short about 3,000 drivers, with the tightest shortages on its western edge. Trucking matters because it's a key marker, Scott says. "It feeds across everything, because in order to move a rig, you need a truck driver; to move oil, you need a truck driver; to move the frac sand, you need a truck driver," he says. The other challenge has been the psychological wear-and-tear of the last downturns that have cost these jobs some of their appeal, even if they pay well. "Even though you may be offered a potentially higher paycheck to go work out in West Texas or New Mexico, it's not home and it's not viewed as reliable," Scott says. "There's a lot of imported labor. Folks are still flying in from other parts of the country and doing two-week or month-long shifts. If you can get a good, steady-paying job at home and avoid the travel, that becomes a very compelling opportunity." Carlsbad city and Department of Development staff are sure some of those folks will make New Mexico their home if they can secure housing and other basic services. Meanwhile, they're weathering some growing pains. "Right before Christmas I went to Walmart for some undershirts, and there wasn't one in the whole store," says Russell Hardy, with the Carlsbad Environmental Monitoring and Research Center, which monitors the Waste Isolation Pilot Plant, and former president of the board of directors for the Carlsbad Department of Development. "It's great for business because, as long as you can find employees, you can make a lot of money. But that's the other downside: Trying to find qualified employees." His own staff tells him their rent increases a couple hundred dollars every time their leases end. Of 18 apartment complexes recently surveyed, 15 of them were completely full. Hotel prices are up, and they're routinely booked close to capacity; parking lots are filled with white trucks. Grocery store shelves are sometimes empty. "It's great to see prosperity and business, and at the other end, it's hard to plan for and hard to gear up for, especially as quickly as it's coming," Hardy says. The state receives about $2 billion in revenue from oil and gas development, according to the Legislative Finance Committee, including through severance and property taxes, royalties and rental income. Another $300 million comes from sales and income taxes on drilling and services. "The money is really coming into our community and we're going to put that back into the state," says Shannon Carr, local development coordinator for the Carlsbad Department of Development. At job fairs, she pitches Carlsbad to potential residents as having "a small-town feel with a thriving economy." None of the growth would be possible without making some concessions, like the worker camps, she adds. "A lot of people have been upset about them moving in right next to their homes, and I understand, that's fair to be upset," she says. "It's impossible to actually have what we have without them. The companies wouldn't have come here without it, so it would have probably affected the state's budget."